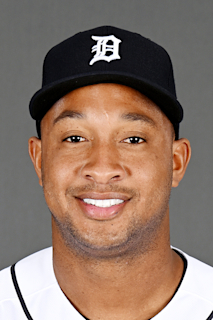 current players: Andrelton Simmons, Ozzie Albies, Kenley Jansen, and Jurickson Profar...Schoop's brother, Sharlon, recently played in the Baltimore organization; was originally signed by San Francisco in 2005...nicknamed by teammates in minor leagues "Mamba" after Kobe Bryant for his love of playing basketball. Began fifth season with Baltimore as their Opening Day second baseman March 29 vs. Minnesota...Placed on 10-day disabled list April 14 with a right oblique strain; appeared in four games between Single-A Frederick, Double-A Bowie and Triple-A Norfolk, returned from rehab and reinstated May 8...Recorded eighth career multi-homer game July 5 at Minnesota homering off Aaron Slegers and Addison Reed...Named American League Player of the Week July 29, hitting .379 (11-for-29) with five home runs and 13 RBI in six games for the Orioles...homered in five straight games July 22-27...Hit .360 (36-for-100) with seven doubles, nine home runs, 19 RBI and a 1.056 OPS in 24 July games... Acquired by Milwaukee July 31 in exchange for infielders Jonathan Villar and Jean Carmona, and right-handed pitcher Luis Ortiz...Hit third career grand slam and tied career-high with five RBI September 9 vs. San Francisco, off Madison Bumgarner...Hit 20 home runs as a second baseman, tied for fourth most in baseball...Combined to hit .233 (110-for-473) with 22 doubles, 21 home runs, 61 RBI and 61 runs scored in 131 games between Baltimore and Milwaukee..played 116 games (102 starts) at second base and 17 games (13 starts) between both teams at shortstop. Recorded his 95th RBI of the season on 8/26 to become the O's all-time single season RBI leader by a second baseman (primary pos.) in team history; his 32 home runs were also a team record for second basemen...Appeared in seven games for Team Netherlands in the 2017 World Baseball Classic...Batted .300 (6-for-27) with four RBI and four runs scored...Selected to the 2017 All-Star Game, his first career All-Star Game selection...Went 1-for-1 with one double, and one run, while playing 3.0 innings at second base...Voted the winner of the 2017 Louis M. Hatter Most Valuable Oriole Award by members of the local media...Named AL Player of the Week for the week of 7/17-23; hit .433/.438/.800 and his three home runs tied for most in the AL...Led the Orioles and set career-highs in hits, runs, RBI, and slugging percentage...His 51 RBI since the All-Star break were the 15th-most in majors and ranked eighth-most in the American League...Ranked sixth in the American League and tied for 12th in the majors with 105 RBI...Ranked sixth in the American League in hits (182) and tied for fourth in multi-hit games (53)...Recorded his first career 100 RBI season and became the fastest Oriole to reach 100 RBI (8/31) since Chris Davis in 2013 (8/1)...His 67 extra-base hits were tied for 12th-most in the American League...His 66 extra-base hits as a second baseman ranked fourth-most in the majors...One of four (Arenado, Lamb, Shaw) infielders (excluding 1B), and the only American League infielder, with 30-or-more home runs and at least 100 RBI...Posted a career-high 26-game on-base streak from 4/12-5/12 (.344/.385/.613)...According to Baseball-Reference, had a career-high 5.1 WAR...Recorded his second career walk-off hit on 9/1 vs. TOR, an RBI double in the bottom of the 13th inning...Recorded at least one RBI in a career-high eight-straight games (7/17-24) with 17 total RBI...Hit .343 (36-for-105) with nine home runs, 21 runs, and 28 RBI in 26 games in July...His 28 RBI were the most in the AL in July and his nine home runs were tied for second-most...Was a part of both triple plays turned by the Orioles; 6-4-3 in the bottom of the eighth on 5/2 at BOS and 5-4-3 in the top of the second on 8/3 vs. DET...His 86 home runs as a second baseman since the beginning of 2014 rank fourth-most in the majors...In his career, the Orioles are 59-23 in games in which he homers. His 162 games played, 164 hits, 82 runs scored, 38 doubles, 25 home runs, 21 walks, and 82 RBI set new career highs ...Tied for frst on the team with 13 game-winning RBI (also Chris Davis)...Collected career-high tying fve RBI on 9.30 at NYY...Posted an 11-game hitting streak from 6/18-29, his fourth hitting streak of at least 11 games in his career and second of 2016...Slugged his fourth career multi-home run game, hit his second career grand slam, and logged a career-high fve RBI on 5/14 vs. DET (2-for-3, 1 BB, 2 HR, 2 R, 5 RBI)...With M. Trumbo, became the frst set of Orioles teammates to post multi-home run performances in same game (4.15) since M. Machado and C. Parmelee on 6/16/15 vs. PHI...Slugged his frst Major League triple on 5.12 vs. DET...His frst triple since 6.12.12 vs. Portland (with Double-A Bowie)...Hit a go-ahead, two-run, two-out double in the 14th inning of 7/6's 6-4 game at LAD...The time of game was 5:26...64 of his 164 hits went for extra bases (38 doubles, one triple, 25 home runs)...His 55 home runs as a second baseman since the beginning of 2014 rank sixth in the majors...In his career, the Orioles are 41-12 in games in which he homers ...Started at second base in the 2016 AL Wild Card Game at TOR (0-for-4). Made 1st career Opening Day start for the Birds, March 31 vs. BOS, playing 2B and going 1-for-3...Ranked 8th among all ML 2B with 89 doubles plays turned...Was 4th among AL 2B with a .987 fielding percentage and 5th with a 16 Total Zone Runs and a 4.84 Range Factor/9 Innings...The Orioles went 14-1 in games in which he homered...Hit 1st HR of the season, April 9 @NYY (Tanaka)...Collected 1st career multi-HR game, May 26 @MIL...Collected career-high four hits, April 18 @BOS...Had game-winning RBI, May 9 vs. HOU...Hit his 1st career HR off a LHP, August 5 @TOR (Buehrle)...Hit his 1st HR of the season at home, August 11 vs. NYY...Homered in three consecutive games for the 1st time in his career, September 2-4 vs. CIN...Tied his career-high with three RBI for the 4th time, September 3 vs. CIN (also August 18 @CWS, August 11 vs. NYY, and April 9 @NYY)...Hit solo HR, September 28 @TOR, giving the O's a 1-0 win in the regular season finale...Started all seven postseason games, batting .190/.292/.238 with a double and two RBI in 24 plate appearances. Recalled, September 3, from Triple-A Norfolk and made his ML debut, September 25 vs. TOR...Went 2-for-3, with a BB, HR, 3R and RBI in his debut...Became the 2nd Oriole in club history to hit a HR in his first ML game (Larry Haney, 7/27/66 vs. CLE)...Batted .256/.301/.396 with nine home runs and 34 RBI in 289 plate appearances while playing second base and shortstop for the Tides...Did not play, May 13-July 25, due to a stress fracture in his lower back...Hit .214/.313/.464 with two home runs in eight games for Team Netherlands in the World Baseball Classic...Also played for championship winning Surprise in the AFL, going 1-for-3 with a run scored in the championship game...Named the Orioles #5 overall prospect by Baseball America...Also named a top 100 overall prospect by Baseball Prospectus (82) and ESPN.com (86). Had his first exposure to Double-A, spending the entire season with Bowie ... Led team in home runs (14) and at-bats (485) ... Was 2nd in games played (124), hits (119), runs (68), and total bases (187) ... Was 3rd in doubles (24) and RBI (56) ... Tied career-high with two homers June 24 ... Tied career-high with four RBI on June 24 and July 13 ... Named the #3 prospect in the O's organization after the season by Baseball America ... Also named Best Power Hitter and Best Infield Arm in the O's system by Baseball America. Was named the Orioles Brooks Robinson Minor League Player of the Year for his time in Single-A Delmarva andFrederick...Named the #3 O's prospect and #82 overall prospect in baseball after the season by Baseball America...Hit acombined .290 with 13 home runs, 71 RBI and a .781 OPS in 128 games (Delmarva 51 and Frederick 77)...He was named theOrioles Minor League Player of the Month for August, the Carolina League Player of the Week August 8-14, and was selected toplay in the Futures Game in Arizona as the Orioles' representative on the World Team...In the Carolina League Playoffs, Schoopwas 11-for-35 (.314) with 11 hits and six runs scored. Led the GCL Orioles with three home runs and was second with 16 RBI despite playing just 17 games with the club...Drove in a career-high four runs June 24 against the GCL Red Sox...Was promoted to Bluefield on July 17...Hit .318 (28-88)with nine doubles, a triple, two home runs, 12 RBI, a .381 OBP and a .511 SLG in 26 games in August...Matched a career-highwith four hits August 30 at Johnson City...Was promoted to Frederick on September 1...Went 3-5 with a pair of doubles, two runsscored and two RBI in his final game of the season September 6 at Wilmington...Was named the 10th best prospect in the Oriolesorganization by Baseball America following the 2010 season. Had a career-high four hits on July 17...Hit safely in final four games of the season, batting .533 (8-15) with two doublesand two RBI. 6 de diciembre de 2018 Minnesota Twins agente libre firmado 2B Jonathan Schoop. 30 de noviembre de 2018 2B Jonathan Schoop eligio agente libre. 1 de agosto de 2018 Milwaukee Brewers activan a 2B Jonathan Schoop. 31 de julio de 2018 Baltimore Orioles cambian a 2B Jonathan Schoop a Milwaukee Brewers for 2B Jonathan Villar, RHP Luis Ortiz and SS Jean Carmona. 8 de mayo de 2018 Baltimore Orioles activan a 2B Jonathan Schoop. 7 de mayo de 2018 Baltimore Orioles envian a 2B Jonathan Schoop una asignaci&oacute;n de rehabilitaci&oacute;n a Frederick Keys. 5 de mayo de 2018 Baltimore Orioles envian a 2B Jonathan Schoop una asignaci&oacute;n de rehabilitaci&oacute;n a Norfolk Tides. 4 de mayo de 2018 Baltimore Orioles envian a 2B Jonathan Schoop una asignaci&oacute;n de rehabilitaci&oacute;n a Bowie Baysox. 14 de abril de 2018 Baltimore Orioles ponen a 2B Jonathan Schoop on the 10-d&iacute;a lista de deshabilitado. Right oblique strain. 5 de julio de 2015 Baltimore Orioles activan a 2B Jonathan Schoop de la 60-d&iacute;a lista de deshabilitado. 2 de julio de 2015 Baltimore Orioles envian a 2B Jonathan Schoop una asignaci&oacute;n de rehabilitaci&oacute;n a Frederick Keys. 19 de junio de 2015 Baltimore Orioles envian a 2B Jonathan Schoop una asignaci&oacute;n de rehabilitaci&oacute;n a Bowie Baysox. 3 de septiembre de 2013 Baltimore Orioles llamado 2B Jonathan Schoop de Norfolk Tides. 26 de julio de 2013 Jonathan Schoop estado en la lista cambian a por Norfolk Tides. 23 de julio de 2013 Norfolk Tides envian a 3B Jonathan Schoop una asignaci&oacute;n de rehabilitaci&oacute;n de Aberdeen IronBirds. 11 de julio de 2013 Norfolk Tides envian a 3B Jonathan Schoop una asignaci&oacute;n de rehabilitaci&oacute;n de GCL Orioles. 14 de mayo de 2013 Norfolk Tides ponen a 3B Jonathan Schoop en la 7-d&iacute;a lista de deshabilitado. 23 de marzo de 2013 Baltimore Orioles opcionado 3B Jonathan Schoop para Norfolk Tides. 20 de noviembre de 2012 Baltimore Orioles seleccionado el contrato de Jonathan Schoop de Bowie Baysox. 5 de abril de 2012 Jonathan Schoop asignado a Bowie Baysox. 24 de marzo de 2012 3B Jonathan Schoop asignado a Baltimore Orioles. 13 de julio de 2011 Frederick Keys activan a 3B Jonathan Schoop de la lista temporalmente inactiva. 9 de julio de 2011 Frederick Keys ponen a 3B Jonathan Schoop en la lista de inactivos temporalmente. 5 de junio de 2011 3B Jonathan Schoop asignado a Frederick Keys de Delmarva Shorebirds. 8 de septiembre de 2010 SS Jonathan Schoop asignado a Bluefield Orioles de Frederick Keys. 1 de septiembre de 2010 Jonathan Schoop asignado a Frederick Keys de Bluefield Orioles. 16 de julio de 2010 Jonathan Schoop asignado a Bluefield Orioles de GCL Orioles. 21 de junio de 2010 Jonathan Schoop asignado a GCL Orioles. 31 de diciembre de 2009 DSL Orioles liberan a SS Jonathan Schoop. 30 de mayo de 2009 DSL Orioles agente libre firmado SS Jonathan Schoop.